1. 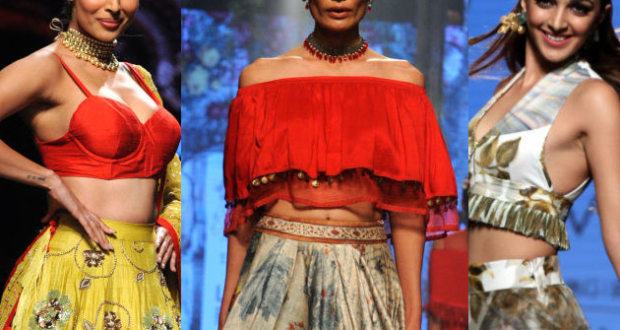 If you want to be hella chic yet hella comfortable, you need to pair your intricate lehenga with a crisp button-down. You don’t even need to worry about your stomach peeking out of your outfit to say hi. 2. If you want to get even more comfortable, it’s totally acceptable to thrown on a sweatshirt now. Pro tip: Wear sneakers. No one can see what’s happening underneath. 3. If you hate that you can’t show your shoes off in ghagras or would like a light breeze for ventilation, try this subtle high-low hem. 4. If you’re in a more tropical setting, carry forward the off-shoulder and choker trend into any wedding venue. 5. 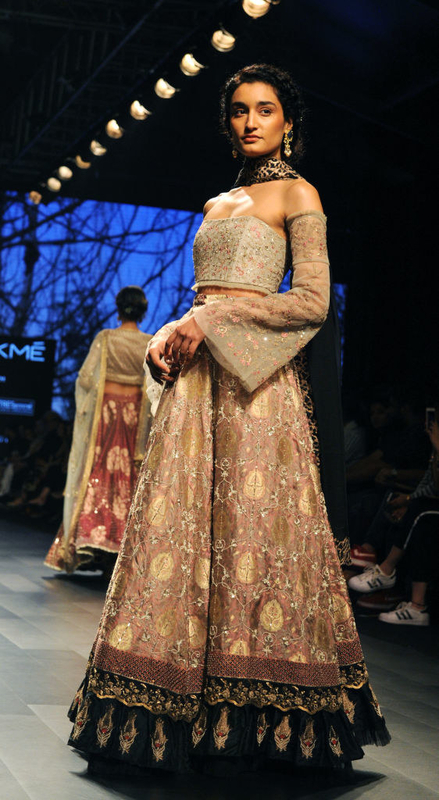 You can easily make it more formal by using the same colour for the top and the lehenga and using lace. 6. 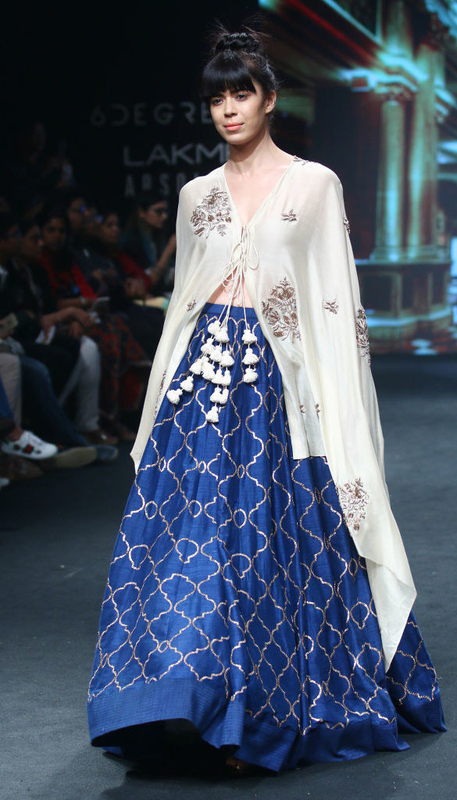 Or wear a super structured and well-fitted choli with dramatic sleeves. 7. 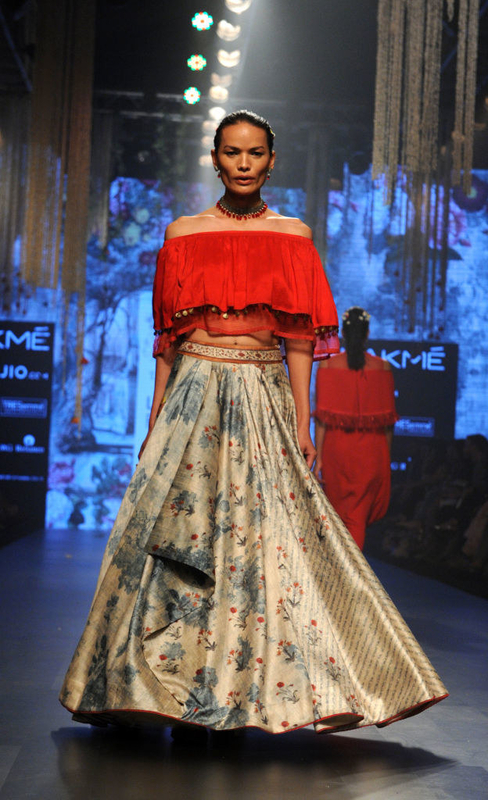 If you want something sexier, get a tinier version like this off-shoulder choli. 8. Adding a light jacket to an easy breezy white lehenga is perfect for a sundown pool party. 9. Or go for a full-on embroidered jacket at a winter wedding. 10. If you, like me, can’t stand dupattas, you need this long airy tunic in your life. 11. Or get your dupatta attached to your choli like a stylish cape and glide everywhere. 12. If you’re not a very extra person, get a flouncy skirt and crop top for proper relaxed and totally danceable attire. 13. But if you are an extra person, wear a layered ghagra. 14. Add even more layers till you end up looking like the Barbie cake we’ve all seen at least once. 15. Or push them all to the bottom to get some ruffled drama. 16. And if your aim is to steal the bride’s spotlight, you need this lacey corset top in your life.